As we cannot quote prices for site prep over the phone it is preferred if you contact the office and provide us with your details so we can find the right contractor to best suit your needs and location. The chosen contractor will contact you no later than 24 hours after contacting Albert Valley Turf. An in-home quote will be performed at a suitable time for both parties. This in-home quote will outline the scope of works and prices for each stage by writing via email. The installation date will not be scheduled until the quote has been approved by the homeowner and a deposit has been paid to the contractor. All site access must be clear and free so the contractors can enter the site at all times while the works are being performed. All machinery and tools are supplied by the contractor. Albert Valley Turf will not be liable for any loss or damage to the site, this includes pathways, driveways, concreted or grassed areas. 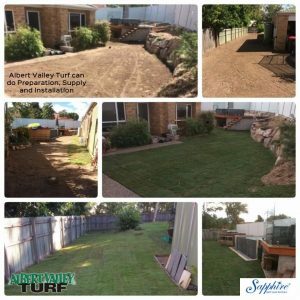 The contractor will organise the supply and delivery of turf from Albert Valley Turf. 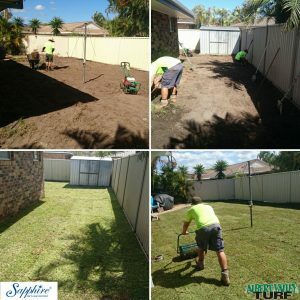 The turf will be ordered by the contractor at least 48 hours prior, if works have been delayed it is the responsibility of the contractor to let us know and postpone the order till a later date. If in the event we do experience rain, this will impact our deliveries as we will be unable to harvest turf. In these events we have to postpone delivery we will contact the contractor directly on the morning of delivery and notify them of the next available delivery day. Albert Valley Turf or the contractors will not be held liable for any visible joins in the turf. Once the turf has been laid it is butted up against each other, if any gaps appear this is due to shrinkage and water must be applied immediately as per our instructions.